The comic and musician will perform at London's Wyndham's Theatre during a month-long residency from this December. All persons aged under 16 must be accompanied and sat next to the accompanying adult. They may not sit on their own within the auditorium. If children do have separate seats, entry could be refused. All patrons, regardless of age, must present a valid ticket to gain entry to the theatre. Please ensure that any children or infants for whom you are responsible also have a valid ticket. Your child should be able to sit unaided within the purchased seat. We do not allow children to be seated on an adult’s lap or babes in arms. 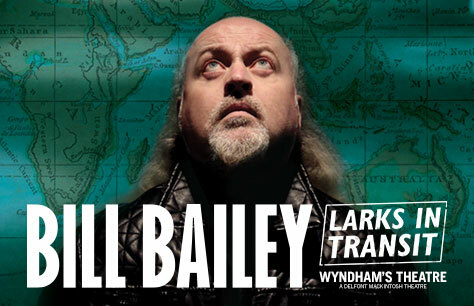 Bill Bailey is the magician of Comedy, weaving his special, hilarious magic through masterful word play and music. We love him!